Both of his parents were born in New York. • United States Census: Resided, 1860, Roxand Township, Eaton County, Michigan, USA. • Military: Company G, 10th Regiment, Michigan Cavalry, 1863, Grand Rapids, Kent County, Michigan, USA. Mustered out on 11 Nov 1865 at Memphis, TN. 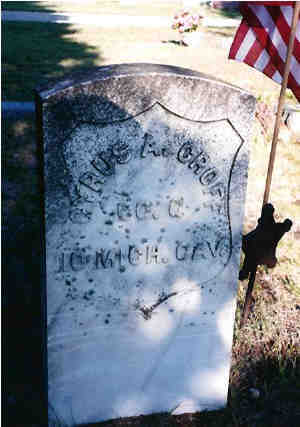 Service Record:Enlisted in Company G, Michigan 10th Cavalry Regiment on 30 Oct 1863. Mustered out on 11 Nov 1865 at Memphis, TN. • Pension: Civil War Pension, 30 Oct 1863, Grand Rapids, Kent County, Michigan, USA. 10th Regiment of Michigan Calvary. • Residence, 1870, Danby Township, Ionia County, Michigan, USA. • Residence: US Census, 1900, Littlefield, Emmet County, Michigan, USA. 1 FamilySearch.org, Michigan Marriages, 1868-1925 (FamilySearch.org : accessed 21 Dec 2011). 2 William Henry Westbrook Family of Michigan (http://www.rootsweb.ancestry.com/~mimontca/families/westbrook1.html : accessed 21 Jan 2011). 3 FamilySearch.org, United States Census, 1880 for Susan Croff (FamilySearch.org : accessed 23 Jan 2011). 4 Cindy Smith, Michigan to David Leas, e-mail, 01-28-2011; privately held by Leas. 6 FamilySearch.com, Michigan Deaths and Burials, 1800-1995 (www.familysearch.org : accessed 21 Dec 2011). 7 Cindy Smith, Grand Rapids, Michigan to David Leas, e-mail, 04 Feb 2011, "Emailing: Ancestry.com - U.S. Civil War Soldier Records and Profiles"; privately held by Leas. 9 Find A Grave, Find A Grave (www.findagrave.com : accessed 19 Dec 2011).